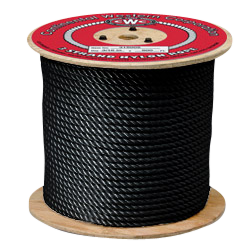 Black 3-strand nylon rope offers high strength and elongation with good resistance to abrasion. 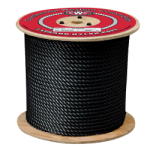 3 strand nylon exhibits great shock absorbing ability, as well as excellent resistance to rot, oil, UV light, mildew, rot, oil, grease, gasoline and many common chemicals. Easy to knot, grip and splice.